Very Thank You everyone of you supporting, I will visit your home town during the following period, Please call for DAVID LEE under hotel register during the following date for appointment, We do accepted all credit card as well. Thank's again for your support, I hope you will find our services to your satisfaction and looking forward to seeing you again. 20 Des Voeuv Road, Central, Hong Kong. 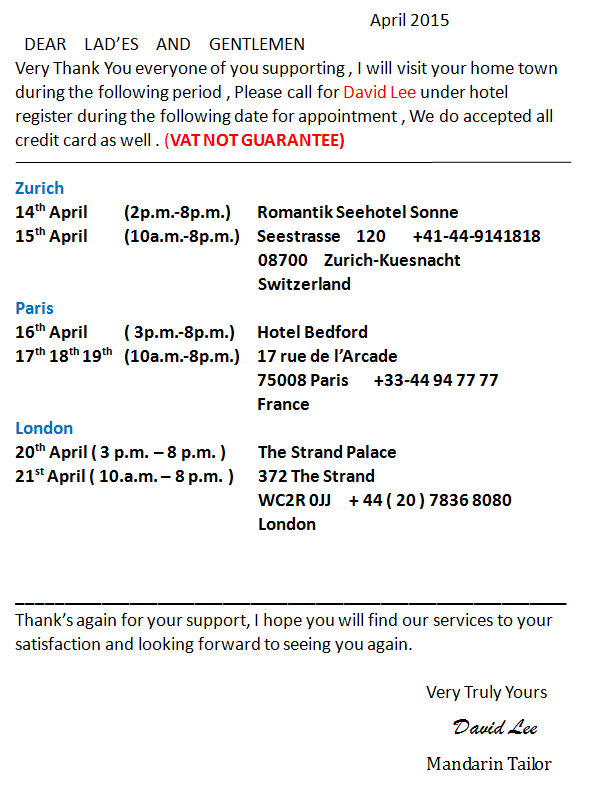 Very Thank You everyone of you supporting, I will visit your home town during the following period , Please call for DAVID LEE under hotel register during the following date for appointment, We do accepted all credit card as well. *Super 130’s suit 499 euro plus shipping. *Super 150’s suit 599 euro plus shipping. *ERMENEGILDO ZEGNA SUMMER SUIT 599 euro plus shipping. *ERMENEGILDO ZEGNA ALL YEAR ROUND SUIT 699 euro plus shipping. I. I.DOGI shirt normal price 110euro,Now only 65 euro plus shipping. II. 100% cotton shirt 60 euro. Including shipping. Shirt Normal price 110 euro . Now only 65 euro. Including shipping (minnium 6 shirts ). Suit Normal price 500 euro. Guarntee received before Christmas . Pay by cash will 3% less. 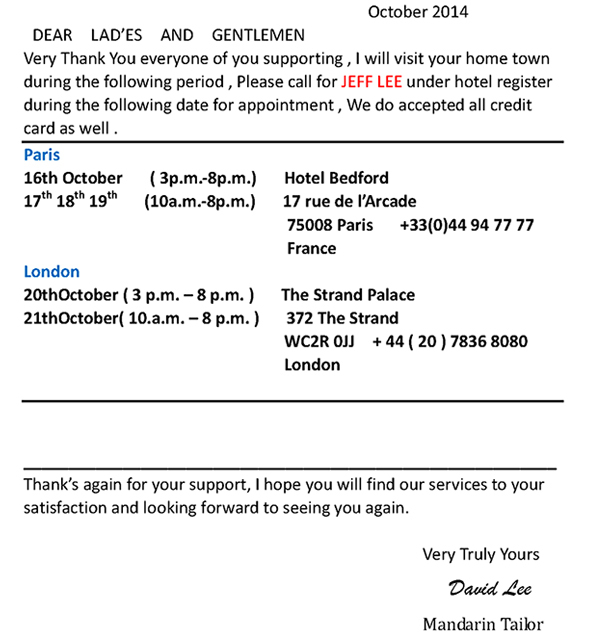 Very Thank You everyone of you supporting , I will visit your home town during the following period , Please call for David Lee under hotel register during the following date for appointment , We do accepted all credit card as well . Pay by Cash will 3% less. Very Thank You everyone of you supporting , I will visit your home town during the following period , Please call for David Lee under hotel register during the following date for appointment , We do accepted all credit card as well . Cash will 3% less. Date for appointment, We do accepted all credit card as well. Pay by cash will 3% less. Date for appointment, We do accepted all credit card as well. *Special promotion for shirts 'S' 6 shirt one person 280 euro include shipping. 'R' 6 shirt one person 350 euro include shipping. 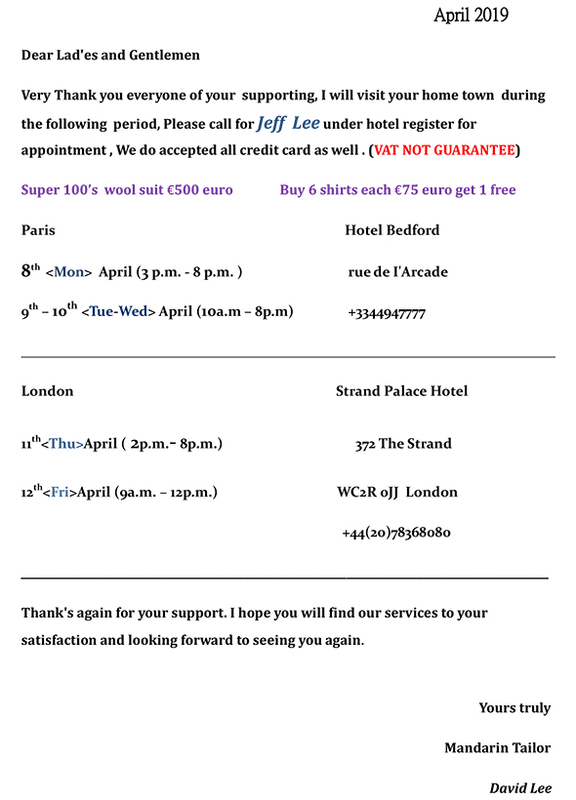 Very Thank You everyone of you supporting, I will visit your home town during the following period, Please call for DAVID LEE under hotel register during the following date for appointment, We do accepted all credit card as well . Pay by cash will 3% less. Thank's again for your support, I hope you will find our services to your satisfaction and look forward to seeing you again. 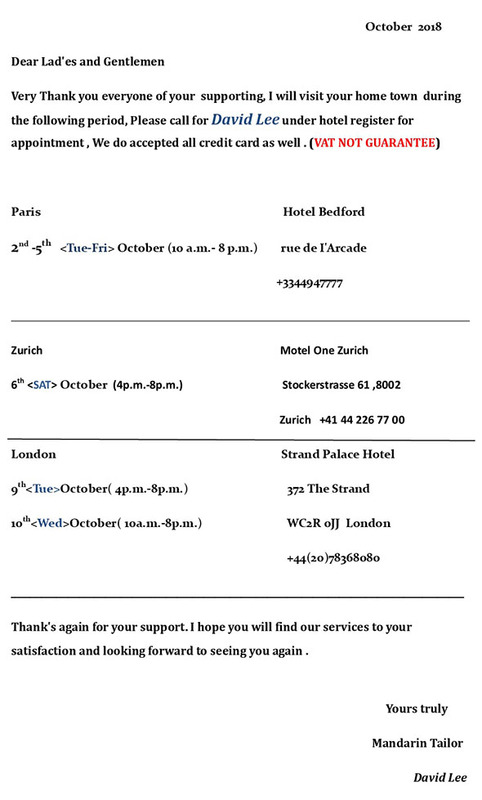 Very Thank You everyone of you supporting, I will visit your home town during the following period , Please call for DAVID LEE under hotel register during the following date for appointment , We do accepted all credit card as well . Very Thank You everyone of you supporting last year , I will be visit your home town during the following period . Please take your time to order tailor-made clothes from me , Find your pattern from any books you see and keep your friends informed of our visit . If you have any clothes which you to copy from .Please bring it with you and see me . Now we are represent suiting and shirting fabrics Ermenegildo Zegan and Cerruti 1881 and most famous company Tessitura Monti from 120’s to 200’s . We Still keep your measurement in our file . 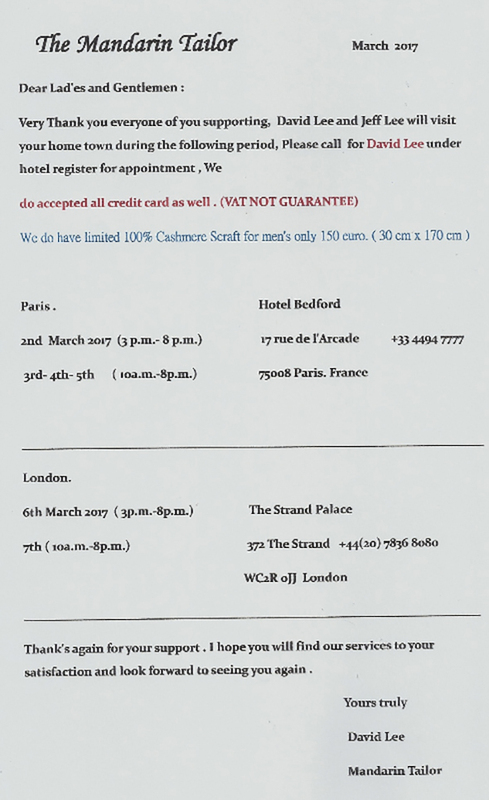 Please call for MR .DAVID LEE under hotel register during the following date for appointment . We do accepted all credit card as well . Thank"s again for your support, I hope you will find our services to your satisfaction and look forward to seeing you again. 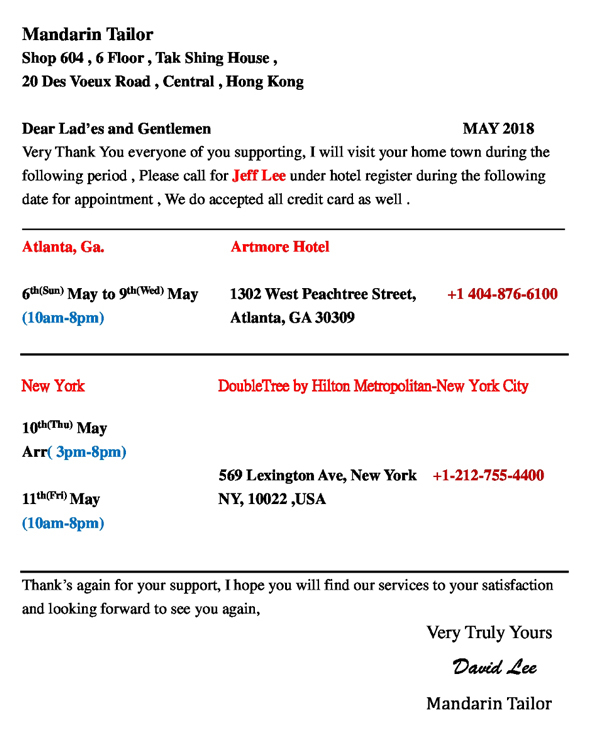 VERY THANK YOU EVERYONE OF YOU FOR SUPPORTING THIS YEAR, I WILL BE VISITING YOUR HOME TOWN DURING THE FOLLOWING PERIOD, PLEASE CALL FOR MR. LEE DAVID UNDER HOTEL REGISTER DURING THE FOLLOWING FOR APPOINTMENT, WE DO ACCEPTED ALL CREDIT CARD AS WELL. THANKS AGAIN FOR YOUR SUPPORT, I HOPE YOU WILL FIND SERVICES TO YOUR SATISFACTION AND LOOK FORWARD TO SEEING YOU SOON. Very Thank You everyone of you for supporting last year, I will be visiting your homeTown during the following period. Please take your time to ordering more tailor-madeClothes from me. Find your patterns fro any books you see and keep your friends informed of our visit. If you have any clothes which you wish to copy from, Please bring it with you and see me . Now we are represent of best men’s suiting fabrics Ermenegildo Zegna and Cerruti 1881 and most famous italy shirting company I.DOGI . ( TESSITURA MONTI ) from super120’s -200’s , I still keep your measurement in our file. Please call for MR. DAVID LEE under hotel register during the following date for appointment. We do accepted all Credit Card as well. Very Thank You everyone of you for supporting this year. I will be visiting your home town during the following period. Please take your time to ordering more tailor-made clothes from me. Find your patterns from any books you see and keep your friends informed of our visit. If you have any clothes which you wish to copy from, Please bring it with you see me. I still keep your measurement in our file. 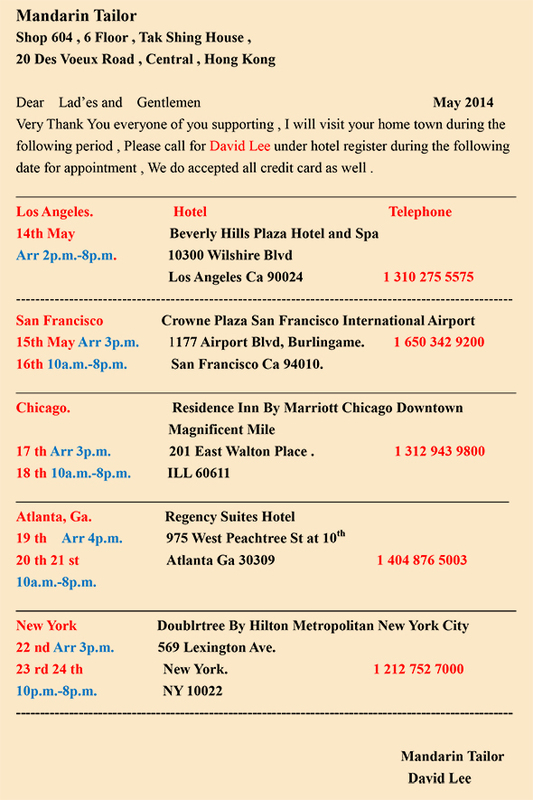 Please call for MR.LEE DAVID under hotel register during the following date for appointment. We do accepted all Credit Card as well. 19 th 12 p.m.-8 p.m.
27 th 2 p.m-8 p.m.
29 th 2 p.m.-8 p.m.
1st August 10 a.m.-8 p.m. Very Thank You everyone of you for supporting last year. I will be visiting your home town during the following period. Please take your time to ordering more tailor-made clothes from me. Find your patterns from any books you see and keep your friends informed of our visit. If you have any clothes which you wish to copy from, Please bring it with you see me. I still keep your measurement in our file. Please call for MR.DAVID LEE under hotel register during the following date for appointment. We do accepted all Credit Card as well.